Cycling as a form of transport needs to be seen in the wider context of local transport as a whole, and at our meeting on Monday 8 April Professor Iain Docherty will set the context by describing current trends and policies in local transport as a whole. 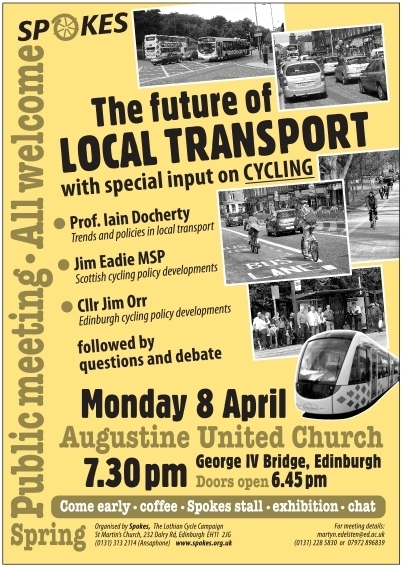 Jim Eadie MSP will outline cycling developments at Scottish level, followed by Cllr Jim Orr describing the Edinburgh situation. There will then be a panel discussion, with questions from you the audience, chaired by Paul Tetlaw. Poster: Download a hi-res poster [pdf 2.6MB] for use elsewhere. Printed copies will also be available and will be sent to members in our March 2 Spring mailout. Iain Docherty is Professor of Public Policy at the University of Glasgow, with interests including sustainability and transport. Jim Eadie MSP is Co-Convener of the Scottish Parliament Cross-Party cycling group, and Parliamentary Officer to the Deputy First Minister and Cabinet Secretary for Infrastructure, Nicola Sturgeon MSP. Cllr Jim Orr is Edinburgh City Council’s Transport Vice-Convener, has responsibility for cycling, and is a Spokes member. Paul Tetlaw is a long-standing Spokes member, also board member and former chair of Transform Scotland.